Monday morning at the butterfly gardens at DeKorte Park and the AMVETS Carillon, we had seven species of butterflies. The butterflies included Eastern Swallowtail, Eastern Black Swallowtail, Monarch, Sulphur, Cabbage White, a Broadwing Skipper (left) and a guy that will be tomorrow's Tuesday Teaser. 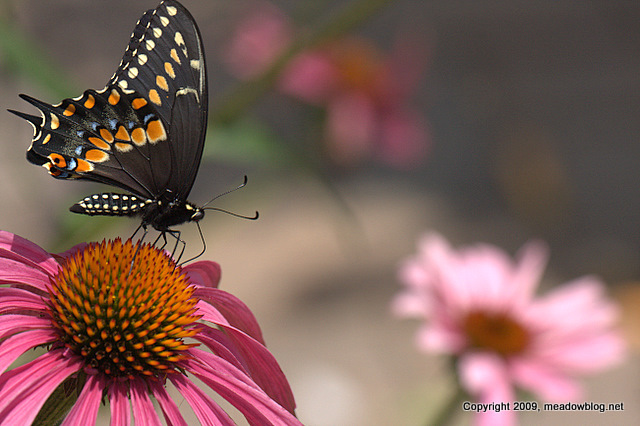 Click here for more posts on Butterflies and Moths. 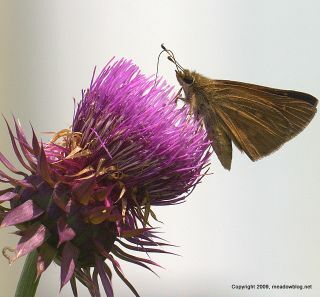 Don’t forget the free Butterfly Walk at DeKortePark in Lyndhurst on Sunday at 1 p.m. – co-sponsored by the N.J. Meadowlands Commission and the Bergen County Audubon Society. Other upcoming NJMC/BCAS partnership events include 90-minute nature walks in DeKorte Park at 9 a.m. on Tuesday, July 21, and in Harrier Meadow, in North Arlington, on Sunday, Aug. 2, and Tuesday Aug. 18, both at 1 p.m.
Every once in a while you run across a strange encounter — like this battle between a Double-crested Cormorant and an eel at Mill Creek Point on the hackensack River last week. At first, it looked like the cormorant had things under control. 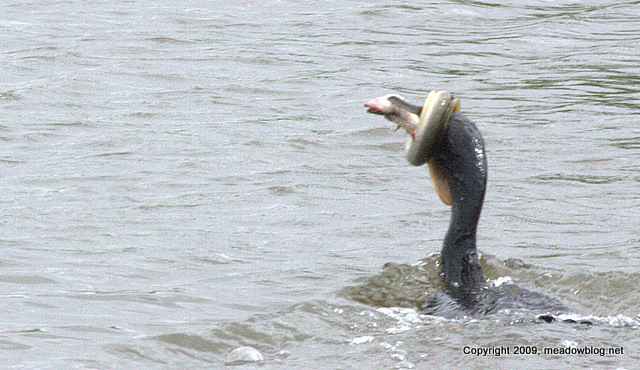 Then the eel wrapped itself around the cormorant's neck. Click "Continue reading…" below the picture to see the entire sequence.